Reliable access to energy sources is driving world economic growth and elevating the standard of living of the burgeoning middle classes. To maintain this growth, oil and gas companies are prudently developing their resources and using cutting edge technology and solutions to revolutionize their energy operations, outplay the competition and ensure compliance. Capital and spend effectiveness:Provide closed-loop management and control of capital and spend to mitigate financial risks and maximize return on all investments. 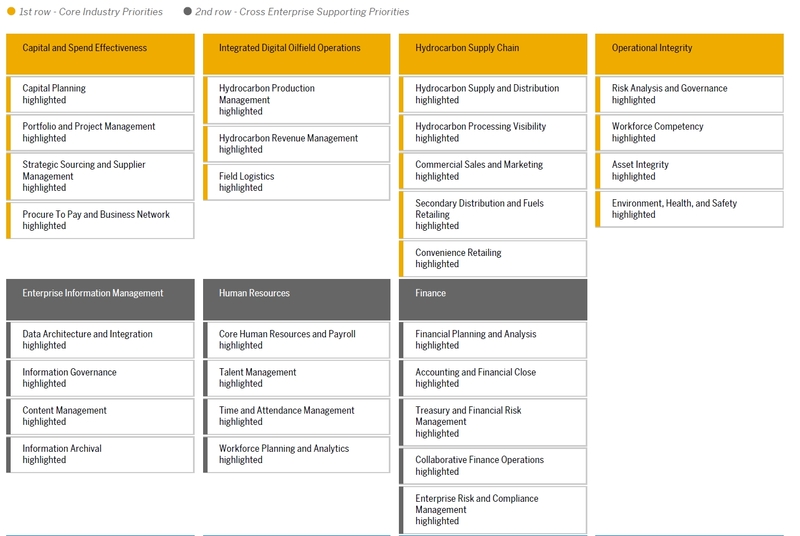 Integrated digital oilfield operations: Converge production, maintenance, engineering, and financials at all levels of the enterprise. Hydrocarbon supply chain: Perfect delivery across the full hydrocarbon value chain, maximize margins, and optimize financial risk. Operational integrity: Simultaneously and proactively manage risks to people, planet, and plant across your entire enterprise. Streamline mergers and acquisitions, improve customer satisfaction and leverage new technologies in discovery, extraction, and delivery. Get instant answers to your business questions with real-time analytics to help maximize your performance and minimize your costs.